One by one, in cities across America, people of all ages are taken from their homes, their cars, their lives. But these aren’t random kidnappings. They’re crimes of passion, planned and researched several months in advance, then executed with a singular objective in mind: revenge. Ariane Walker is one of the victims, dragged from her apartment with few clues to follow. The police said there is little they can do for her, but that isn’t good enough for her boyfriend, Jonathon Payne. Thankfully, he has the skills to do something about it. With the help of his best friend David Jones, Payne gives chase, hoping that a lead in New Orleans somehow pays off. 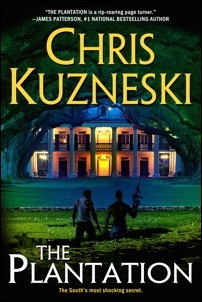 Together the duo uncovers the mystery of Ariane’s abduction and the truth behind the South’s most violent secret: the Plantation.